Basically you need a Windows Server that has PowerCLI installed. There are some current limitations (must have .net 4.0 and PowerShell 2 or 3), but it seems supporting newer versions is on the roadmap. So I would suggest just using Windows Server 2008 R2 as 2012 has .net 4.5 installed by default. The VERY first thought I had with this was introducing UNMAP into the vSphere Client, since as of now it is only a CLI option. Of course @lamw–who I have exchanged a few emails with about UNMAP in the Web Client recently–already beat me to it here. So I decided to take it a few steps further. 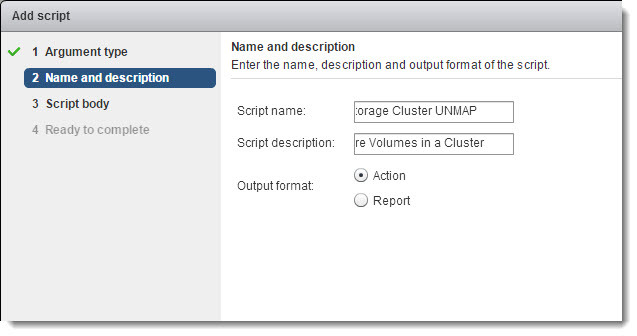 On any All-Flash-Array with data reduction (or really just anything with thin provisioning) UNMAP is a very important part of managing your storage–especially in environments that have a lot of virtual machine turnaround so to speak. Running a CLI command all the time is somewhat annoying and requires a few steps that takes you out of your normal operating environment (the Web Client). Pretty simple but really saves a lot of time if you are often running UNMAP. Easy and convenient! So let’s walk through it. 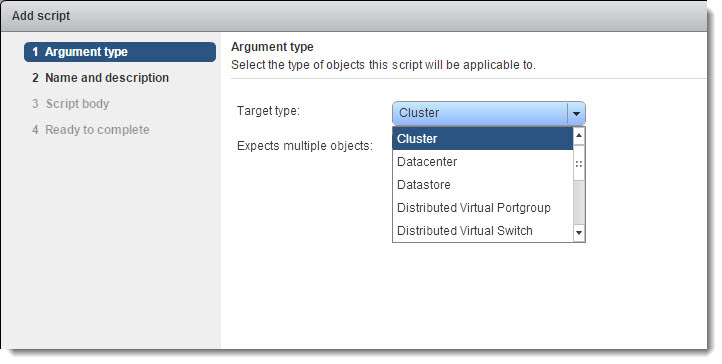 The first option you choose in the menu is what object in the vCenter inventory should this appear and be allowed to run against? A datastore? A VM? A cluster? 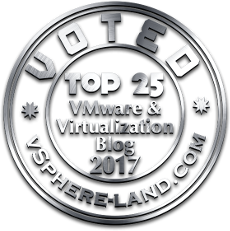 The whole vCenter? Up to you. For this I wanted to choose a cluster. Then you name the script and give it a description. Also choose if it is an “action” or a “report” this way you know when you run the script later if it will change something or just look at stuff. Now we can actually write our script. You can write it in the wizard or anywhere–I used ISE and then copy/pasted it in. A few notes on writing PowerShell for this–it does weird things with write-host where if you combine objects and text it does some weird new line stuff–so you have to workaround that a bit. You’ll see what I did in my script to get around it. The cool thing is that it automatically imports whatever object you selected in the wizard as an object you can quickly use in the script. It saves it as $vParam. In this case it was my cluster (so the cluster you end up right-clicking). 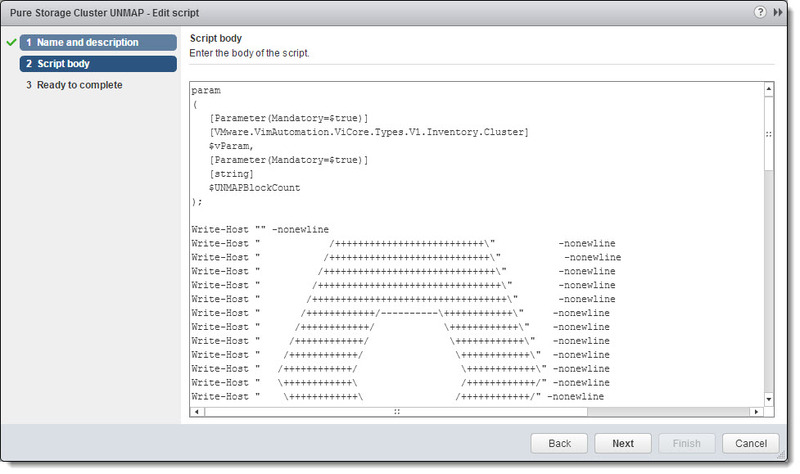 You can change whatever you want in the lines it inserts–you don’t have to use the $vParam naming convention etc. 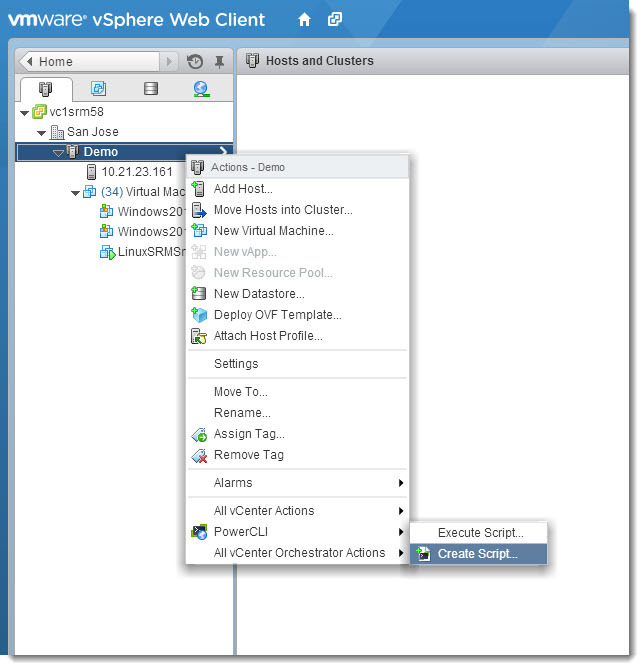 The script I wrote can easily be changed to work on just one ESXi host, or iterate through and entire vCenter. A single datastore is really easy to do. Also note, it is already connected to the vCenter so you don’t have to do the connect-viserver stuff. 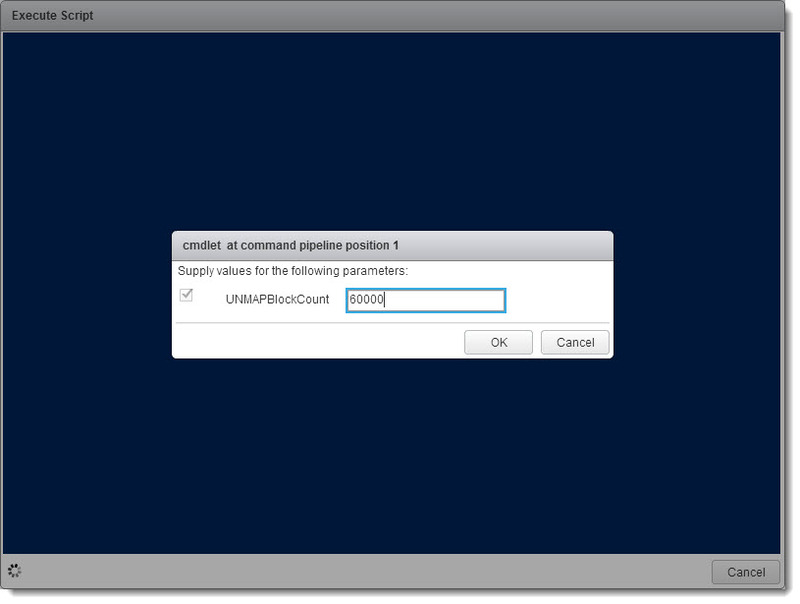 So to kick it off just right-click the cluster and choose the PowerCLI menu option, then the correct script. Only the ones assigned to a cluster object will appear. The script will immediately start running. My script asks the user just one thing–the block count for UNMAP (note this script is only for ESXi 5.5 with esxcli UNMAP). unmapcluster Just a docx file. The script is pasted below as well. So many more things I want to do with this, stay tuned! write-host "Searching for VMFS volumes to reclaim (UNMAP)"
$textoutput = "Found " + $datastores.count + " VMFS volume(s)." write-host "Iterating through VMFS volumes and running a reclamation on Pure Storage volumes only"
$textoutput = "Please be patient, this process can take a long time depending on how many volumes and their capacity"
$textoutput = $datastore.name + " is a Pure Storage Volume and will be reclaimed." $textoutput = $datastore.name + " is not a Pure Volume and will not be reclaimed. Skipping..."
$textoutput = "Reclamation finished. A total of " + $volcount + " Pure Storage volume(s) were reclaimed"
Thanks for the wonderful Script. I copy/paste the given content and ran the script, it didn’t gave me any output or the running screen. It simply freeze the WebClient. Thanks Codyhosterman. Did you get a chance to test the script ? I haven’t unfortunately. Due to other activities I do not think I will be able to get to it for some time.